Neither human nature nor personality can be independent of culture. Human beings share certain social norms or rules within their cultural groups. Over 2000 years ago, Aristotle held that man is by nature a social animal. Similarly, Xun Kuang (298-238 B.C. ), a Chinese philosopher, pointed out that humans in social groups can not function without shared guidance or rules. This book is designed to provide readers with a perspective on how people are different from, and similar to, each other --both within and across cultures. One of its goals is to offer a practical guide for people preparing to interact with those whose cultural background is different from their own. "Lee, McCauley, and Draguns add substantially to the recent revival of interest in the impact of culture on personality….Their volume blends the theoretical and practical, and several chapters are relevant for business--an important feature in this age of multinational companies." "The book makes for illuminating reading….a valuable resource for cross-cultural researchers and those hoping to stay abreast of work in this reawakening field. It should serve as a rallying point for students of culture and personality and a sign of the vitality of cross-cultural personality research. The truly international representation of contributors and cultures is admirable, as is the combination of research on personality with investigations of lay perceptions and theories of personality. The editors are to be commended for producing an intriguing snapshot of a field in motion." Contents: Preface. Part I: Introduction. Y-T. Lee, C.R. McCauley, J.G. Draguns, Why Study Personality in Culture? L.A. Pervin, The Cross-Cultural Challenge to Personality. Part II: Basic Personality Differences Between Social and Cultural Groups. J.P. Rushton, Ethnic Differences in Temperament. D. Peabody, Nationality Characteristics: Dimensions for Comparison. C. McCauley, V. Ottati, Y-T. Lee, National Differences in Economic Growth: The Role of Personality and Culture. Part III: Personality Across Cultures. R. Diaz-Loving, J.G. Draguns, Culture, Meaning, and Personality in Mexico and in the United States. K. Zhang, Y-T. Lee, Y. Liu, C. McCauley, Chinese-American Differences: A Chinese View. B.I. Okeke, J.G. Draguns, B. Sheku, W. Allen, Culture, Self, and Personality in Africa. G. Oettingen, H. Maier, Where Political System Meets Culture: Effect on Efficacy Appraisal. P. Laungani, Cultural Influences on Identity and Behavior: India and Britain. L. Miller, Stereotype Legacy: Culture and Person in Japanese/American Business Interactions. Part IV: Implications of Studying Personality and Person Perception in Culture. V. Ottati, H.C. Triandis, C.H. Hui, Subjective Culture and the Workplace: Comparing Hispanic and Mainstream Naval Recruits. R. Brislin, Communicating Information About Culture and Personality in Formal Cross-Cultural Training Programs. C. McCauley, J.G. 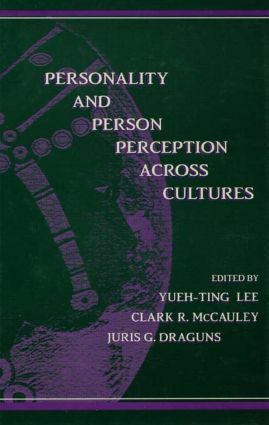 Draguns, Y-T. Lee, Person Perception Across Cultures.